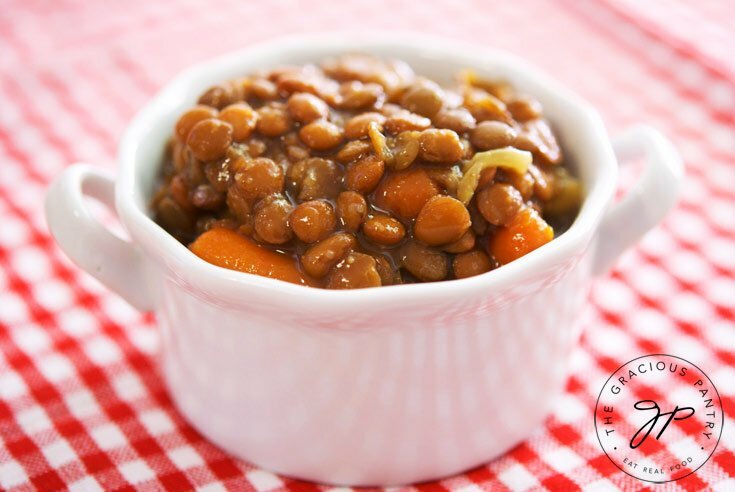 This clean eating slow cooker lentil soup recipe is perfect for a chilly evening at home! I’ve done several lentil soup recipes. For me, there is something very comforting about lentils. They feel homey and nurturing. Even more so when they come out of the slow cooker like this clean eating slow cooker lentil soup. I like this recipe simply for it’s ease. You can’t get much simpler than using a slow cooker. Plus, it’s a wonderful Meatless Monday dish to come home to after your first day back at work for the week. It makes enough to freeze some for a few future meals and freezes really well too. I like to make some for dinner and pack the rest away in the freezer for quick and easy, grab-n-go lunches. I take it straight from the freezer and by the time I get to lunch, it’s mostly thawed. And if not, a quick few moments in the microwave or in a pot on the stovetop gets the job done. Give it a try! It’s a great way to stock your freezer for the cold months! Nothing says comfort like a bowl of lentil soup. Perfect on a cold evening, this soup will warm your belly and soothe your soul. 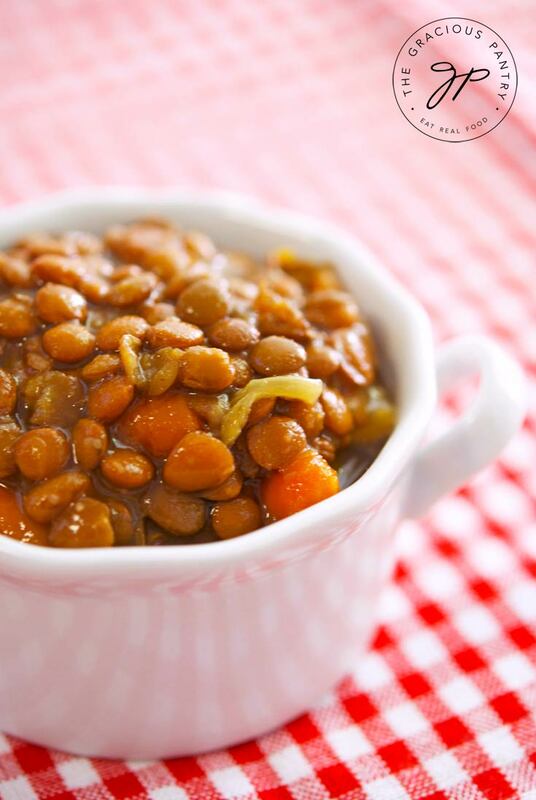 Combine all ingredients in your slow cooker and cook for 8-10 hours on low, or until the lentils are fully cooked. This recipe from the Gracious Pantry archives, originally posted 1/11/14. I can’t wait to try this! Just one question, what type of lentils? Brown? Erin L – Yes, I used brown lentils. 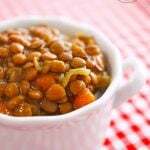 My lentil soup recipe is great, but it’s not “slow-cooker easy”. Can’t wait to try this! Linda – Fantastic! I hope you enjoy it! Is lentils the same as split peas? Only new to these foods. Bought all the ingredients tonight to make this. This is my first time working with lentils. What do I need to do to prepare the lentils if anything? Thanks!!!! Jenny – Some people soak the lentils overnight, but I never bother. So nothing I can think of! I hope you enjoy it! I just started the Daniel Fast last week, and i’ve been looking for meatless, breadless, dairy-less, and finally sugar-less foods lol! I bought some pre-made lentil soup last night but it had a low amount of sugar in it, and I was upset that I didnt notice that initially. I will definitely be trying this recipe out, because I love lentils, and it’s a good/filling/easy thing to eat and cook while I’m fasting. My husband doesn’t like celery, is there something else I can swap with it?? What about spinach? Sharon – I would just put a few extra carrots in and omit the celery. Jessica – Sure! It’ll freeze just fine. I’d put a date on it for about 6-8 months though. Hi just wondering if I could use split peas instead of lentils? Nicole – I’m not sure if the ratios would work out, but I do have a split pea recipe here you could try. Christa – Let me know if the munchkin likes it! Lentil soup is a weekly meal on Greek tables. It is super easy and doesn’t have to be slow cooked! Throw in a pot: 1/2 bag lentils (brown, sm or lg), 1 onion-diced, 2 garlic cloves- chopped, 1 cup pureed tomato, 3 cups boiling water, 1/3cup olive oil, 2 bay leaves, 1 tsp salt & 1/2 tsp pepper. Non-traditional options: add a celery and a carrot chopped up. Leave to simmer an hour of so (time depends on freshness of lentils). May need an extra cup of boiling water added. Enjoy with a nice baguette and feta. Greek Yiayia trick for decreasing the gasses? pre-boil the lentils for 5 mins, and the diced onions for a couple of mins, strain and go on with the recipe above. I tried this recipe today and the taste was great but the lentils were still tough. I checked it after 9 hours on low and they were not done so I turned the crockpot on high and after 4 more hours (13 total) they were still underdone. I followed the recipe as it was stated. Jennifer – Were they older lentils? How long have you had them? They were recently purchased. I just used a store brand that I have used in several other recipes. Jennifer – That’s really odd. Did you soak them before cooking? How long to cook if I need to put slow cooker on high? Hayley – About 4-6 hours. Just realised I have bought the wrong lentils. My supermarket only had red split , could I still use them? Lucy – I’ve never cooked with them but I imagine it would work about the same. Do you have suggestions for a side dish? I think a salad would be perfect, but my husband does not like salads! Tasha – Yes, a salad would be great with this. But what kinds of things DOES he like? If you can give me an idea, I’ll have better suggestions for you. I made this yesterday, it was delicious! I followed everything but added some sliced mushrooms because I love them. Thank you for sharing! Hi. Going to try this but before I do, can I use chicken broth vs. vegetable stock? Thanks. I set this up according to the directions in the crock pot last night and put it on low for 10 hours as the recipe directs. This morning, I checked on the soup expecting it to be thick like the picture shows, but it was soupy and liquidy and the lentils were still tough. I got brown lentils and didn’t soak them or anything, since I saw in the comments that you don’t soak them, so I’m confused as to why they haven’t soaked up some of the stock and thickened the soup up a bit. I’m not eating it until tonight anyway, so I set it for another low 10 hour cycle in hopes that will help it cook through… I’m not sure what the issue is. Any ideas? 2 cups of lentils to 8 cups of stock seemed like a pretty low ratio, but I figured it would just absorb a bit and come out thick like in the picture, so I just went with it. Cristina – The measurements are correct. At least that’s how I make them. I would check a couple things. 1. Be sure your lentils are not too old. 2. Be sure your crock is cooking properly. I can’t imagine why it wouldn’t cook if the above two things are all in order. Was everything hot when you checked it? I am experiencing the same thing as the above comment. it has been in the slow cooker for 9 hours and still really soupy and the lentils are still hard. My slow cooker is fairly new and I haven’t had any issues with it and the lentils were purchased last night. Can I add anything to thicken it up? how much longer should I cook for? This recipe sounds great, but mine has been cooking for 11 hours (6 on high and 5 on low), and the lentils are nowhere near cooked nor have they soaked up the broth. It’s a brand new crock pot and bag of lentils. When I realized this, it was a mad rush to find something else for dinner for the family, including a 5 year old and 16 month old. This is the second time I tried this recipe and it’s happened both times. (I used an old crockpot first time and just thought it didn’t turn out because the pot was going bad). Apparently that was not the case. Could I use already cooked lentils from Trader Joe’s?? Maybe lessen the cook time?